← Ladies and Gentlemen: Meet Gumdrop! Friday, April 1st, 2011 at approximately four in the afternoon we kicked off our first official Pilver Family of Three road trip. It’s been nearly two years since I have driven cross country and the nomadic strands of my DNA were jonesing for a fix. Our destination is warmth. I studied a map until I found the warmest place we could easily travel in the allotted time frame. I chose Mexico. Mexico was an awful choice being that I lack a passport and the cities nearest for driving are not always the best for tourism. So, we decided New Mexico was a just-as-good second choice. On our first day we drove and drove and did nothing else and saw nothing fun. 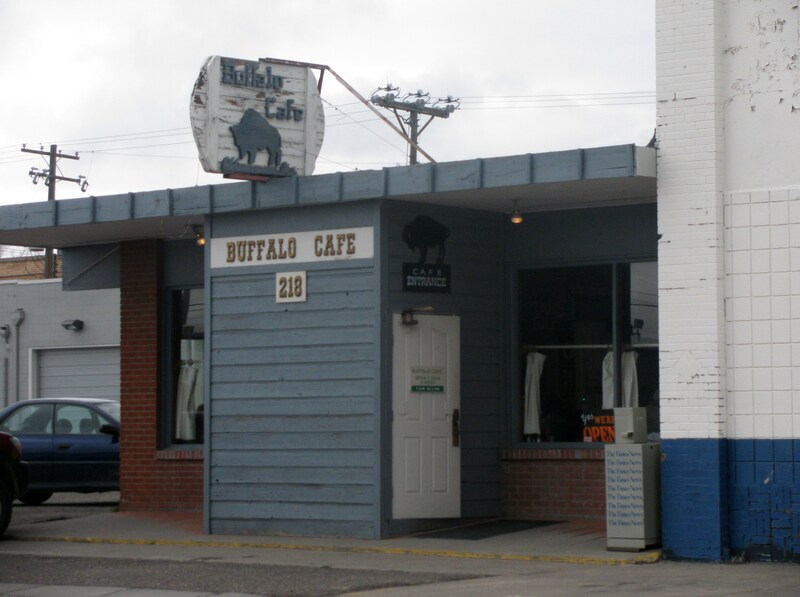 Day two was more eventful, beginning with a memorable breakfast at the Buffalo Cafe in Twin Falls, Idaho. Pregnancy has left me with bizarre eating habits. Every couple hours I am starving to the point I must eat so I do not become physically ill. However, once I sit down to eat I fill up after roughly thirteen small bites. But this doesn’t mean I am done. Sipping on a glass of water for fifteen minutes rejuvenates my appetite and thirteen more bites are taken. This pattern repeats until I feel I am actually full, or The Max grows too wild for a restaurant atmosphere. The Buffalo Cafe was a great place to eat in this manner. We ordered four different plates between us and with the exception of the small amount saved for our patiently waiting in the car dog, we ate it all. After Idaho, comes Nevada. With Nevada, comes gambling. The bordering town is called Jackpot and nobody lives there. In Jackpot are a handful of restaurants, a few gas stations, and many many casinos. 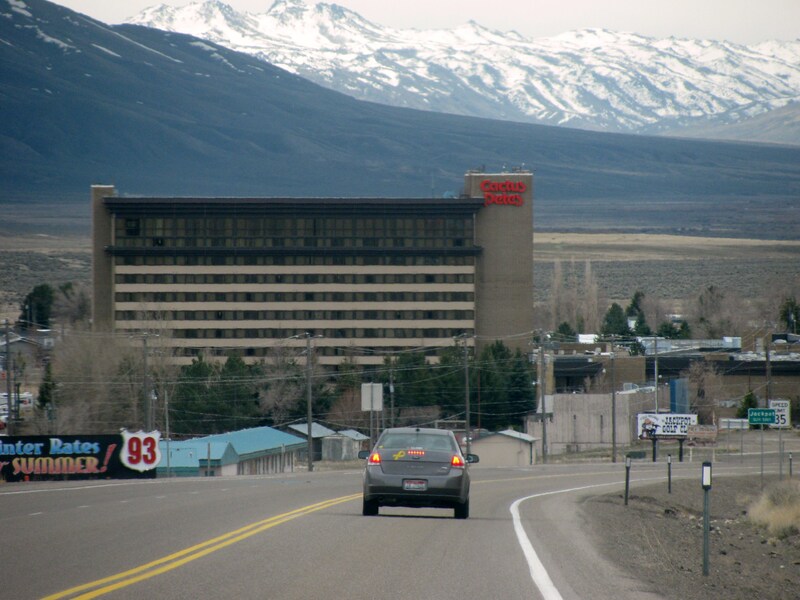 It’s as though the people of Idaho cannot WAIT to gamble so they build the things as near to them as legally possible. Yesterday was important, because I saw something that has haunted me since I was eleven years old. After entering Utah, the Bonneville Salt Flats begin almost immediately. 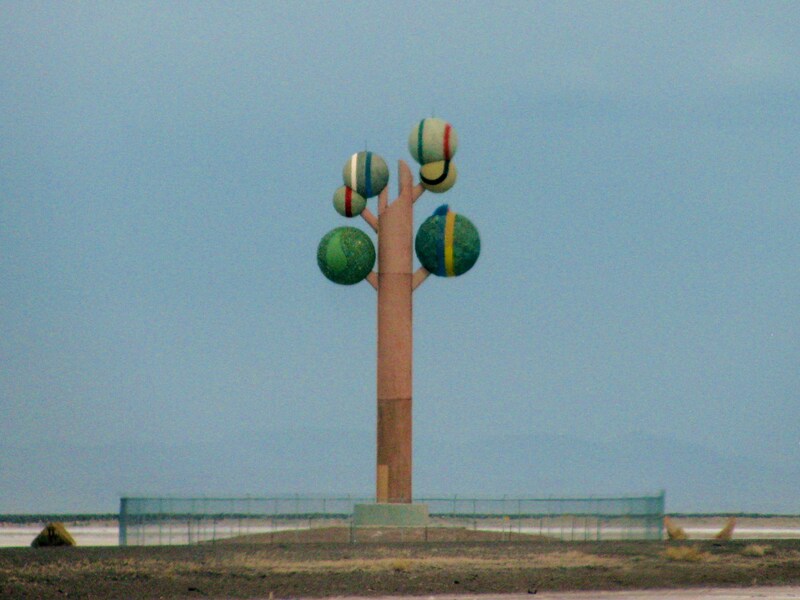 When I was there two decades ago I remembered this crazy statue in the middle of nothing but salt. While I remembered it clearly, my memory was plauged with doubts that the structure couldn’t possible exsist because it was placed in such a desolate location that it must have only been a mirage. Yesterday I took a picture of it, and it has a name. I would like to present to you, Metaphor: The Tree of Utah! The last time I was here, there was not a barbed wire fence surrounding the statue and I clearly remember climbing all over the base. I’m a little upset that I could not recreate that memory though viewing the structure once again was well worth the two hours we took out of our way so I could make sure it was real. I photographed many more things, and someday I am going to show you those things. Now, I am going to sleep. As always Kristiane, this was a fun and interesting read. I haven’t been around much lately so naturally I was pleasantly shocked to hear that you are expecting another little pilver. Also, as much as you like road traveling, I wish you guys would come to Texas. I’ll tell you where to go. We ALMOST swung down into El Paso. On the way, there were all these annoying Border Patrol check stops and we decided against it. I have been to Texas a few times, not for more than ten years though. I’d love to see Corpus Christi again. Wow! I grew up in Corpus Christi. I didn’t leave there until my mid 20’s. El Paso is a dreadful place. Dangerous right now too.